For other wonderful items, make sure to visit us at our About Me Page. Avengers #96 Art by Neal Adams. 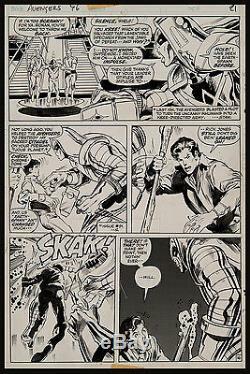 Original artwork from Avengers #96 page 16 (Marvel Comics, 1972) by the living legend himself, Neal Adams (pencils) with ink finishes by Adams, Tom Palmer and Alan Weiss. This is an impressive action page that prominently features the arch villain, Ronan the Accuser as he interrogates a very defiant Rick Jones, who shows the Kree Supremor just exactly what he thinks of him with a powerful blow to his head. Great multiple images of Ronan who is gaining greatly in popularity especially since is major role in the Guardians of the Galaxy movie (2014). Art is in excellent condition with image size measuring approx. Small paste in panel at bottom of panels 2-3. The item "Avengers #96 Art by Neal Adams Ronan" is in sale since Monday, May 29, 2017.